We are in the deepest cold of winter with negative temperatures and everything is buried under a thick blanket of snow. What glows in the wintry landscape are all the beautiful evergreen trees and the leafless branches and tree trunks. I got inspired by this muted and peaceful color palette and brought it indoors to decorate our living room for winter. Please note: Some of the links in this post are affiliate links, which means I may make a small commission on the sale of an item through these links but the purchase price remains the same for you. Thank you for supporting the Sheep Shop blog! Seasonal decorating doesn’t have to cost a lot of money or take a lot of time to put together. This winter living room was done in no time with things I already own. I only purchased two checker plaid throw pillows, which cost $12.88 for both pillow covers. I also made two DIY hanging juniper botanical prints and I scored a free antique slat rocking chair on Craigslist. Another inexpensive idea for seasonal decorating is to take a walk, snap a picture, and pop it into a frame. I took a photo of the church to the left of our property and had it enlarged at our copy center for $2.00. I like to use different types of greenery during the winter than I used during the holidays. I clipped some juniper and pine cone bush branches from our land and sprinked them throughout the room. 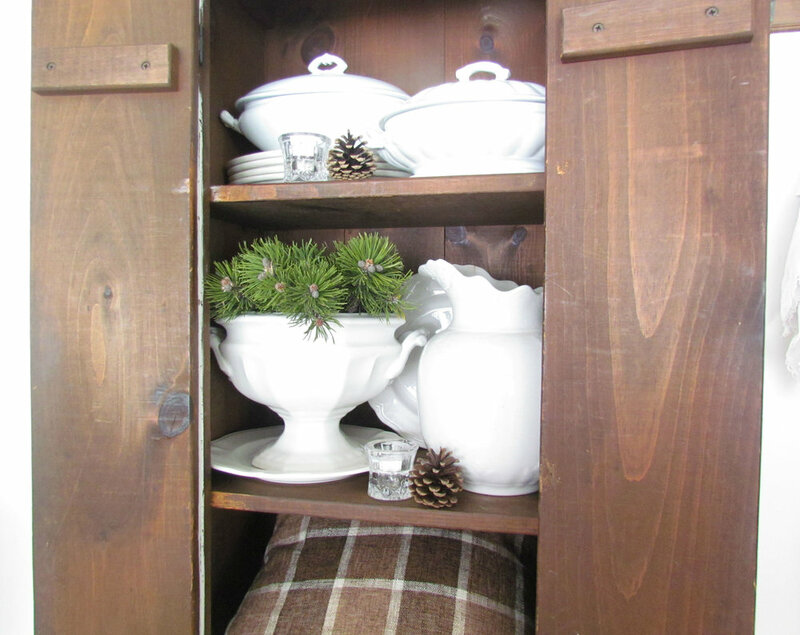 For the cupboard, I kept it simple with fresh greenery, pinecones, and tealight candles. 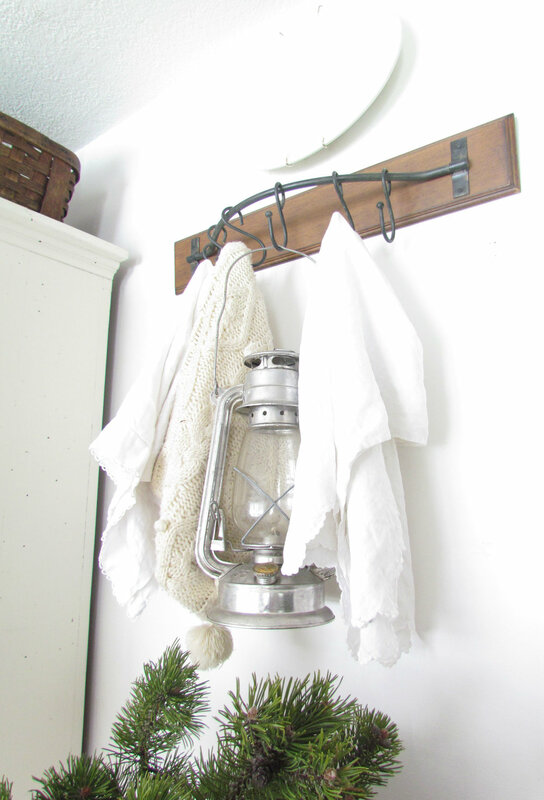 I also hung an oil lantern above the crock and vintage snowshoes on the antique door. I hope this inpired you to infuse some winter cheer to your home, even if you are short on time and working on a shoestring budget.